In the real world, it’s important to have a good reputation. The same goes for the digital world. In fact, when it comes to producing new patients, your online reputation could be even more important. Prospective patients rely on online reviews more now than ever, avoiding chiropractic practices that are riddled with negative feedback. So how do you improve your digital rep? The most impactful way – online reviews. If it’s positive, your online reputation can be an excellent marketing tool. It’s one of the most powerful assets you have to convince prospective patients to contact you. The social proof contained within reviews and star ratings help patients expedite their research and make decisions faster and with greater confidence. And finally … 84 percent of people trust online reviews as much as a referral. Before adding your practice, search your name to see if you already have a listing that can be claimed and edited. This is important, as you don’t want to create duplicate listings. If you don’t show up in the search results, create a new listing and add your practice information. When it comes to acquiring directory listings, it’s important to understand the trinity of information known as NAP (name, address, and phone number). It may sound simple: In each directory, include your practice name, address, and phone number. But NAP is more than just adding or claiming a listing. It’s about ironing out every little detail to ensure accuracy and consistency. NAP also has SEO implications. 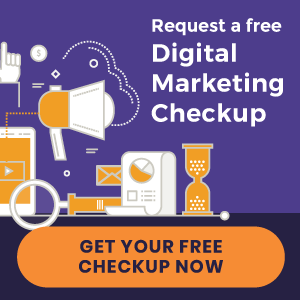 Not only is it important to prospective patients who are trying to find accurate information about your practice, it ensures that your website is easily understood by search engines. Make sure your office address displays exactly the same on every directory. For example, don’t write 123 54th Avenue, Suite 2 on one review site and 123 54th Ave. Ste. 2 on another. When it comes to NAP best practices, there’s no such thing as a minor detail. Google is the most popular search engine. People use it for a number of reasons, including to find local businesses in their area – like chiropractic practices. When someone searches for a business near them, Google listings often show at the top of the organic results. These results then link to online reviews, a map listing, and general contact information of a business. Not only do online reviews offer social proof of your practice, they play an integral role in how well you rank in Google’s results. To improve your web traffic and rankings, your goal is to get as many five-star reviews as possible. And, as little negative reviews as possible. However, it’s important to note that over the years Google and other review sites have caught onto deceptive review-promotion efforts. Such tactics may be tempting, but they could derail the reputation of your listing. You could risk getting reviews removed, or worse, have your account blacklisted altogether. 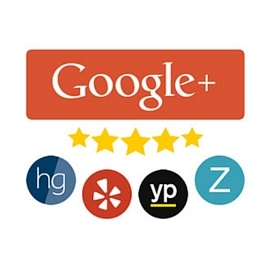 Having family, friends, or staff members leave reviews for your practice violates Google’s terms of service. “Fake glowing testimonials,” as the search engine describes them, do not genuinely represent a business. Moreover, reviews submitted by SEO companies will likely be removed and/or result in a penalty. Setting up a computer station in your office to acquire reviews may seem like a legitimate practice. Indeed, this is a way to gain genuine, first-hand feedback from your patients. However, Google doesn’t see that way. A stream of reviews being posted from one location will likely be removed. Google is explicit about offering compensation in exchange for online reviews. This doesn’t just include cash. Gift cards, products, and any other form of compensation fall under this umbrella. Request reviews during a follow-up phone call. Create print materials, listing places patients can review you, that can be provided to patients following their appointment. In addition to these more traditional tactics, there are several online marketing strategies you can tackle. Email is arguably the most powerful. New patient surveys not only provide valuable internal information, they’re a way to promote online feedback. For instance, the Perfect Patients New Patient Survey is a technology that automatically secures reviews on a client’s behalf – in a compliant manner. How does it work? A welcome email and survey is automatically sent to a new patient after they’ve been added to a client’s website. During the survey, patients will click on an emoticon that best describes their experience. After completing the survey, the patient is provided with an opportunity to leave a brief review. Based on their answers, the New Patient Survey determines the patient’s satisfaction with your practice. If the patient is satisfied, they are encouraged to share their experience on review sites like Google and Facebook. Reputation management is only one way to improve your online presence. 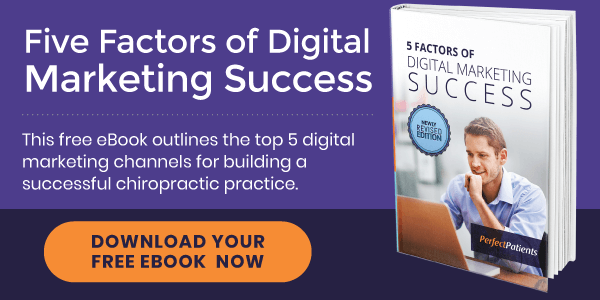 There are countless online chiropractic marketing strategies you can implement today. Download our free eBook below for actionable steps for reaching your new patient goals.